City plans camera surveillance web: "Chicago will become a world leader in Big Brother technology when the city links 2,250 surveillance cameras to the 911 center to spot 'suspicious and unusual' behavior. "With help from a $5.1 million federal Homeland Security grant, Chicago will install 250 cameras at locations at high risk of a terrorist attack, link them and 2,000 existing cameras to the 911 center and expand the network with an unprecedented invitation to the private sector, Daley announced Thursday. "When a 911 call comes in, the network will automatically search for the nearest camera. A video image will pop up at the call-taker's work station. The call-taker can control the image and direct police and firefighters at the scene. Thirteen employees stationed at a soon-to-be-built operations center at the 911 facility also will continuously monitor the cameras. "Suspicious or unusual behavioreverything from walking in circles at an airport or downtown parking garage to leaving a package untended in a public placewould prompt a change in color on the video image and set off an alarm. "Daley thinks Chicagoans 'will love' the idea. 'We're not inside your home or your business,' Daley said. 'The city owns the sidewalk. We own the street and we own the alley.'" Don't forget, Mayor Daley, that in America, the government that you say owns that property is also of the people. The people own the sidewalk, the street, and the alley. "Before deciding on a system for Chicago, officials saw how Las Vegas casinos monitor their gamblers and examined how the U.S. Department of Defense uses cameras during combat and to protect its facilities. "They also went to London to check out its 200,000-camera surveillance system. Great Britain has more than 4 million such cameras, one for every 14 people. In London, cameras have spotted about 10,000 incidents and footage has been used in about 1,000 court cases in the last two years, officials said. 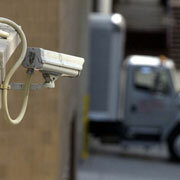 About two-thirds of Britons approve of the cameras, according to a European Commission study. "But Cedric Laurant of the Washington-based Electronic Privacy Information Center was skeptical of their usefulness. Studies show they have less of an impact on crime than improving lighting in dangerous areas, he said. Despite the use of cameras in London, crime has gone up in the last 10 years, he said. "Chicago needs to develop rules that prevent civil-rights abuses, spelling out how long recordings can be kept and how they can be used, Laurant said. And the city should conduct annual audits to track how many crimes are stopped because of such surveillance, Laurant said."